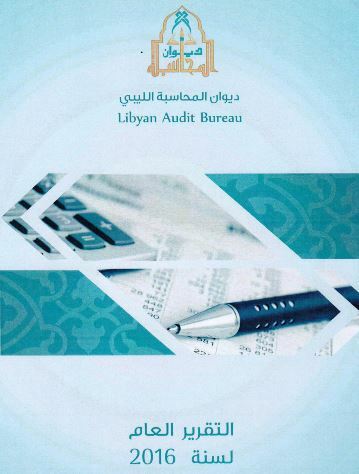 The Tripoli-based Audit Bureau says in its 2016 Annual Report that corruption is rooted in Libyan culture and is practiced by 86 percent of society (Photo: Tripoli Audit Bureau). Notwithstanding the legacy of its previous 42 years of dictatorship, Libya’s current crises and wars are caused by widespread corruption on all levels of society as a result of the transition stage that the country is going through. It is also caused by those with ‘‘weak souls’’ taking advantage of the lack of stability in order to achieve personal gain at the expense of the nation and society. The conclusion was reached by the Libyan Audit Bureau in the chapter (chapter 2, page 55) on corruption in its 623-page 2016 Annual Report published at the end of last April. Fighting corruption in Libya needs to start with the acceptance by all that corruption in rooted in the psyche and culture of Libyans and that Libyans should set about getting rid of it, it added. Corruption needs to be assessed and mechanisms need to be put in place in order to fight it and get rid of it completely. Corruption has become a common and general culture practiced on a daily basis by nearly 86 percent of society, the Audit Bureau stated. The squandering of public funds, the failure to safeguard it and its misuse in inappropriate ways. The misuse of power and authority to achieve gains for others. The use of public office in an excessive manner despite weakness in capabilities and lack of knowledge of the needs of the position and its responsibilities. Corruption in making appointments and in contracts to achieve commission. The corruption in the use of cash floats. The signing of contracts without adequate prior study or signing contracts for which there is no real need. False compensation agreements with contractors and the imposition of false penalties on the state. Giving up the state’s rights to contractors and foreign partners. Corruption in health insurance contracts in giving payments to hospital/clinic managers. The Audit Bureau said that it had referred 109 files of different forms of suspected cases corruption to various relevant bodies in 2016 for further action.